The Visne Apartment is on the ground floor, overlooking the gardens of the exclusive and hidden Han Inn Complex. Even most locals don't know about it! The apartment is light and bright and in an ideal location for visitors who do not want to walk too far to discover all that Kalkan has to offer. Less than 3 minutes from restaurants and bars yet completely quiet and peaceful in its garden setting. Easy access to the heart of the village, shops, beach, harbour and beach clubs. Drift across the huge swimming pool in your inflatable armchair or relax under a palm tree with your favourite holiday reading. Enjoy alfresco meals on your private terrace overlooking the pool, or take a short stroll to the local restaurants. The award winning architectural design of this small and unique complex affords each apartment an individual character and layout. Inside, the apartment, recently fully refurbished, is tastefully furnished and offers a modern and comfortable environment. My wife and I visited Turkey for the first time in 2013 and stayed in Kalkan. 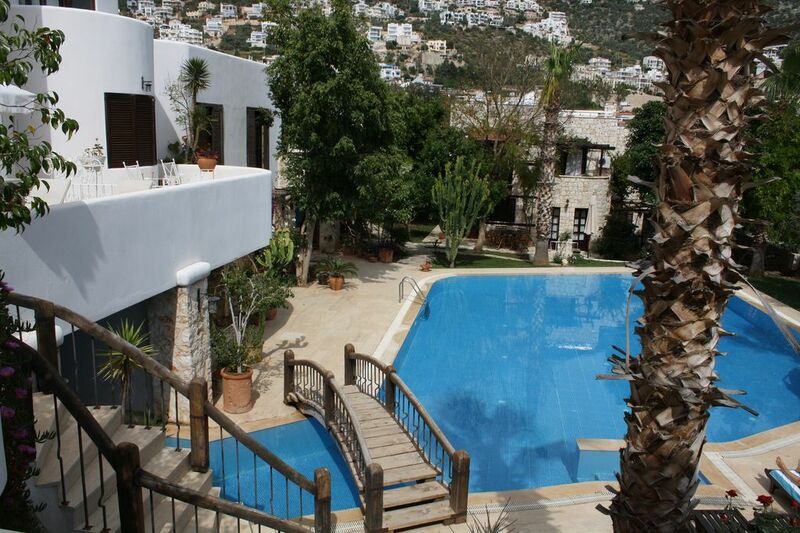 We fell completely in love with it and could see ourselves returning regularly, so we bought this flat to enjoy Kalkan and the lovely surrounding areas whenever we could. We enjoy relaxed living, beautiful surroundings, plenty of sun and good eating and all this can be found in spades here. We love our little home from home and hope that you will too. We want our guests to have a happy stay so, if there is something particular that you need, please just let us know and we will see if we can help. Kalkan is very pretty and has managed somehow to retain it's natural charm whilst also offering everything all that you need for a wonderful holiday. We were immediately taken by the atmosphere and the lovely people and felt completely safe everywhere. In addition, there was plenty to entertain us both locally and further afield so, taking everything into account, we decided that this was was definitely the right place to buy. We loved the private and peaceful nature of the complex, with a gorgeous pool and gardens which provide an oasis of calm and Turkish charm and yet a stone's throw from the buzz of the town. Having its own private terrace overlooking the pool was particularly special - we just had to have it! Fully tiled with huge shower, WC, and bathroom cabinet. Bright, open plan living room and kitchen, with patio doors and shutters leading to private terrace with two loungers and umbrella. Living area has a sofa, two armchairs, dining table and 4 chairs. TV/DVD/CD player. WiFi broadband. Grill in oven. Gas hob. Well equipped kitchen, recently fully renewed. Good working space, with hob, extractor fan, microwave/grill/convector combi oven, toaster, fridge/freezer, washing machine, iron and ironing board. Backgammon and Scrabble. Airbeds with electric pump. Snorkels+masks. Entrance on ground floor but garden and pool are 1 floor below our terrace. Not suitable for children. Han Inn is actually closer to town than the Google pointer shows!! That's technology for you. Less than 10 minutes walk to the local beach and closer to beach club. There area number of local beach clubs with excellent facilities, including a wide range of water sports. 20 minutes by minibus to Patara beach - 15 kms of totally unspoilt, golden sand, home of the nesting turtles, where sunbeds and umbrellas can be hired for the day. Take a mattress with you, however as none are provided! Approximately one hour 40 minutes by car from Dalaman Airport,. Airport transfers can be arranged. Antalya airport is approximately a three hour drive. Because of the location of the apartment, in the heart of all amenities, car hire is not required but should you wish to hire a car to explore the region, there is ample free parking outside the apartment and in the village. Kalkan is situated at the foot of the Taurus mountain range and there are several Ottoman towns and villages in the mountains, particularly Elmali, which has well preserved traditional wooden houses. This is about 80 kms from Kalkan, a stunning drive through the mountains of an hour and a half. 40 kilometres from Kalkan, along the coast, is the village of Kaya, where the Louis de Berniers novel, 'Birds Without Wings' was set. The village is now deserted, but there are several small restaurants. The winding streets of Kalkan offer the visitor a wealth of attractions. There are over 150 restaurants, to suit every taste and pocket. Sit at one of the harbour side bars or cafes, watching the sun go down as you plan where to go for dinner. Browse in the local shops selling everything from silverware and carpets to 'designer' handbags and very well priced jewellery. For the adventurous, try the wide range of water sports available or book a day on a diving course - there are several PADI dive centres in the village. To totally relax, have a day at sea on a gullet, swimming, snorkelling and getting away from it all. The apartment is very close to well stocked local supermarkets, which sell everything you could possibly need. There is a butcher less than 5 minutes walk and banks with 24 hour ATMs three minutes away. Every Thursday, Kalkan has a local market with a wide range of goods from holiday souvenirs to fresh fruit, vegetables, herbs, cheeses and olive oils brought down from the mountain villages. Taste the locally produced olive oil and you will never want to buy the commercial variety again or try the local olives; dozens of varieties. Several tour companies in the village offer a range of day trips. Group sizes are kept small and the trips give you the chance to go much further afield without hiring a car. In particular we recommend Saklikent Gorge and Tlos, a magnificent mountain gorge with ice cold water running through, and very well preserved historical site with ruins from Greek, Roman and Byzantine times and the one day trip to Kekova, a sunken city, incredibly well preserved. For the very active, Kalkan is on the Lycian Way, described by the Sunday Times as one of the 10 best walks in the world. There are a number of clearly signposted walks, from three to six hours and of varying degrees of difficulty originating in the village.